I remember as a child, my father would occasionally sneak into the fridge for food, this was significant as he wasn’t a grazer or prone to eating out with mealtimes, so it was a rare sight when it did happen. There were two things that would lure him, leftover cooked sausages and alioli. For the sausages, he would casually grab one and very happily finish it before leaving the kitchen again. For the alioli, he would come armed with a piece of bread and grab the small glass jar in which my mother would keep it. He would generously spread some over the slice of bread and carefully replace the glass jar in the fridge, before finishing off the piece of bread. I don’t recall my mother making alioli all that often. She was British, so it wasn’t something she grew up with. It was my father’s influence, and thankfully my mother’s culinary interests which made her so accepting to so many different foods. However, when we had lamb she would make some and place it in this special glass jar. It felt very ceremonious to me as a child. Something to be regarded as very special. It wasn’t until I had moved to Spain and my Abuelo (Grandad) taught me how to make this by hand. 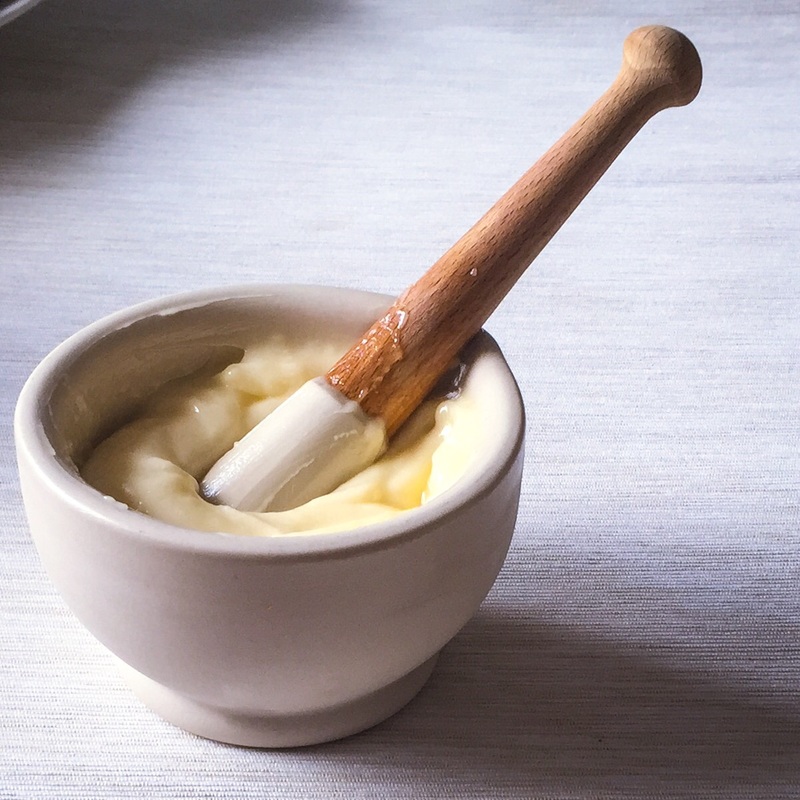 He called me into the small kitchen of my flat and had taken out a traditional mortar and pestle, a yellow glazed affair with four corners to it. Once I learned to make it, I made it all the time! It went with all the Spanish food I knew how to make, and then anything else I could come up with which might suit it. 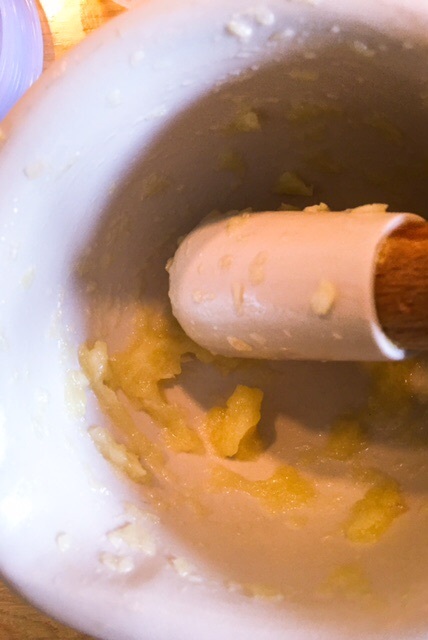 Even living in London, years later, without a mortar and pestle, I would crush some garlic and using a wooden spoon and a regular bowl I could be found making alioli. If you have a good food processor you can easily use it to make this for you. I however still choose to do it by hand where I can gauge the feel of things as I make it. Begin with the garlic. Peel the cloves and add them to your mortar along with a pinch of salt. Pound the garlic into small pieces and work them into a sticky paste. Once you have a smooth paste, add in the egg yolk and mix these together. Now this is the critical bit, with one hand working the garlic and egg mixture, use the other to very slowly drizzle the olive oil into the mortar. You want the oil to mix in as you are going. Don’t be afraid to stop pouring and work the oil in before picking up the oil again. It should form a pudding like consistency, which will hold until all the oil is added. Once you have added all the oil, add a the juice of half of lemon and check the flavour. You may need to add a little more salt or lemon juice. Adjust to taste. Keep in a clean, airtight container in the fridge for up to 3 days. Goes well with most things. I like it in particular with BBQ meats, tortilla and especially lamb! Note – If for some reason things haven’t come together then stop right there. You can salvage this! Decant the mixture and start again with the garlic and egg and slowly add the oil again. Once you have it working, you can gradually add the other mixture into this slowly. You will just end up with a larger supply of alioli, which isn’t all bad!